W.E. 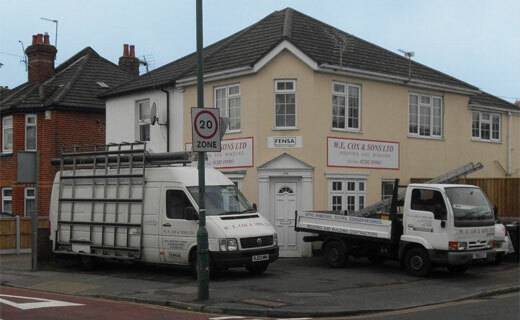 Cox and Sons is a Roofing and Double Glazing company. We undertake all aspects of small building works including UPVC Fascia, Soffit and Guttering. We also install kitchens and bathrooms, and can provide a decorating and carpentry service. The Family Business That Cares. W.E. Cox and Sons Ltd provide high standards of workmanship in all jobs undertaken whether it is a complete re-roof or just a small room that needs to be decorated. All work is fully guaranteed for your peace of mind. We provide an excellent after service. As we believe every customer should be treated with respect and courtesy and offer this as standard. All the way through the work schedule we like to keep you fully up to date on progress. A phone call to our office can provide you with an answer to any questions you may have before, during or after any work is being carried out. W.E. Cox and Sons Ltd provide Free Estimates for all work and hope you will choose us, as we aim to be very competitive. We offer a high quality standard of work in the local Bournemouth area with our dedicated team of professional staff providing a friendly, reliable sevice that is second to none. Covering the local Bournemouth area, including Poole, Ferndown, Christchurch and most of Dorset and Hampshire.